Cape Town – Details of Optimum Coal Mine's turnaround have been revealed in an affidavit filed by the mine's business rescue practitioners. Johan Louis Klopper and Kurt Robert Knoop, who received their business rescue licenses on February 19, were appointed by eight Gupta-linked companies two weeks ago as creditors lined up. They were meant to meet with Parliament's Portfolio Committee on Mineral Resources last Wednesday. However, this meeting went ahead in their absence. 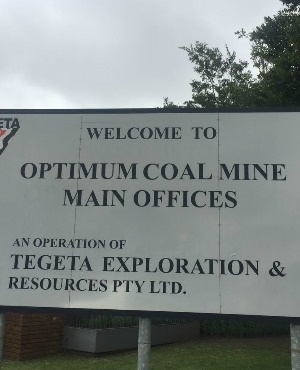 Knoop told the parliamentary committee that "urgent legal action" prevented him from attending the meeting, while Klopper said he was "addressing staff at the mine on the business rescue process". The two were forced to defend urgent liquidation proceedings last week from various creditors. News24 has seen a copy of Optimum's replying affidavit, deposed by Knoop. In the affidavit, Knoop denies claims by Optimum's creditors that the company is tainted by a "Gupta stench". The papers reveal that the two business rescue practitioners remain adamant that the business can be turned around. Knoop states that one commercial bank has approached the mine, offering to provide financing services. Another has also confirmed its interest in doing so. Knoop maintains that Optimum is a viable business entity, with assets of more than R6bn and an annual turnover in the past year of R3.1bn. According to his affidavit, the mine is producing and selling coal, and generating significant revenue in the process. It has also commenced negotiations with Eskom for payment of an outstanding R52m, as well as ring fencing its existing debt with Eskom. An additional three coal supply agreements have been negotiated, but not signed as yet, which Knoop hopes will bring in another R96m by Monday. A meeting scheduled for March 7, will seek advice from mining consultants on a possible turnaround strategy for the mine. The papers also outline that Bank of Baroda's sudden exit is to blame for business rescue proceedings being instituted. Bank of Baroda was the last bank still maintaining a business relationship with the Guptas, and announced its exit in February 2018. The bank plans to uproot its South African operations by the end of this month. In anticipation of the operational difficulties to be expected following Bank of Baroda's impending closure of their accounts, Optimum required the protection of the business rescue process in order to continue doing business. This prompted the director, Gupta lieutenant Ugeshni Naidu, to file for business rescue. The High Court in Bloemfontein heard arguments on March 1, from lawyers acting on behalf of Atul Gupta and other Gupta-linked firms that the Bank of Baroda's exit is an attempt at circumventing an existing court order. In October last year, the North Gauteng High Court ordered the bank to keep the Guptas' accounts open, after several commercial banks stopped providing financial services to the family's businesses.